Are you fond of plants and believe that your house or office will come alive when there are plants in the space? 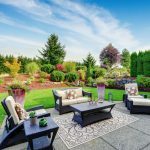 Your plants will give a soft, lively, natural way to touch your environment. Sturdy plants are suggested and you should locate them in areas where they can thrive. Deciding which plant to use, which pot to use, what will blend with the interiors, where to place them, how many pots are all questions you can ask your plant expert. A bit of greenery makes a huge difference to a solid furniture and tiled space. All the curtains, walls, tiling, seating, storages, are big and solid and plants add a soft feminine touch, balancing the stiffness and bring in life and color. In the United Arab Emirates (UAE), all homes are air-conditioned due to the excessive heat. Plants need 25-35 degrees Celsius to survive. High temperatures inside do not work well for indoor plants. It would be best to place the plants near a window or where it can get a bit of sunlight and natural light. If not, you need to add artificial yellow light for it to survive. • Areca Palm – Dypsis Lutescens, Kentia Palm, Phoenix Roebelenii, Zamioculcas are some palms that do well indoor. • Schindapsus or Money Plant, Dracaena Massangeana, Dracaena Marginata, Pachira, Spathiphyllum, Monstera, Philodendron, Yucca Elephantitis, Croton, Coedium Petra, Daiffenbachia, Chlorophytum, Schefflera , are some commonly used plants. Many varieties of Ficus like Starlight Ficus, Ficus Benjamina, Ficus Elastica, Ficus Microcarpa are grown here. Ficus trees also cannot tolerate low temperatures or drafts. They need to be kept in temperatures above 15 degrees Celsius. and actually prefer temperatures above 21 degrees Celsius. When growing ficus or other plants indoors, it is important to maintain a relatively high humidity around the plant. Regular misting or setting the plant on a pebble tray filled with water is a great way to increase their humidity. But keep in mind that while they like high humidity, they do not like overly wet roots. Therefore, when watering, always check the top of the soil first. If the top of the soil is wet, do not water as this means they have enough moisture. If the top of the soil feels dry to the touch, this indicates that they need water. Some plants need much less water. Ficus are also prone to pests, mealy bugs, scale and spider Mites. A healthy Ficus tree will not see these problems, but a stressed Ficus tree (likely losing leaves) will surely develop a pest problem quickly. “Sap” dripping from a Ficus houseplant, which is actually honeydew from an invading pest, is a sure sign of an infestation. Treating the plant with Neem Oil is a good way to handle any of these pest issues. Recently, self watering planters are becoming common as they reduce maintenance and over or under watering. Many shapes, sizes and colors are available in planters. Self watering planters help you to avoid daily watering and the problems of over or under-watering.The large water reservoir in the bottom of the container is simply filled using the integrated water supply shaft. The plant then takes care of itself for up to 12 weeks with exactly the right amount of water and nutrients that it needs for optimum growth. Apart from the fact that plants need to be watered much less frequently, self watering planters ensure that your houseplants develop beautifully and this all-round care rewards you with better growth than with conventional culture systems. And the best thing: this system also works for potted plants outdoors – on the terrace, on the balcony or in the garden. 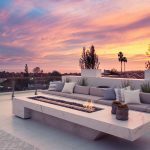 You need to choose a planter that suits your Interiors or exterior theme, color and expanse of the area besides looking at the height of the ceiling. Choosing very small planters for large areas makes them look dwarfed and out of proportion. Plants need to be planted on a height that one can see it at eye level just like paintings. Having plants at different heights in a cluster may also be a good idea for a corner. Neutral pots are great for any interior. 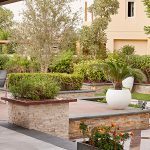 Glossy planters, Matt finish Glass Reinforced Plastic (GRP) planters, Terracotta or Ceramic planters, Mosaic clad or mirrored planters are some planters that are available here in Dubai.